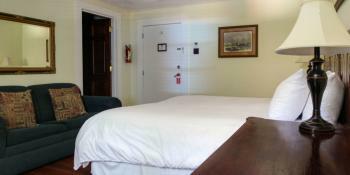 This is our deluxe balcony room on the second floor. 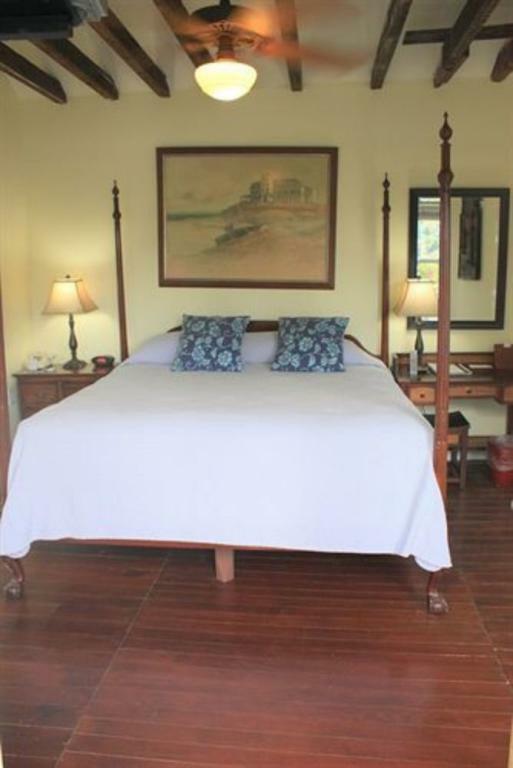 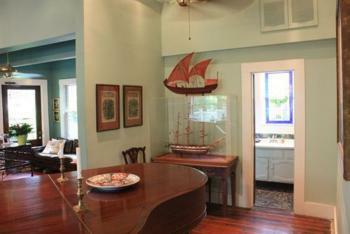 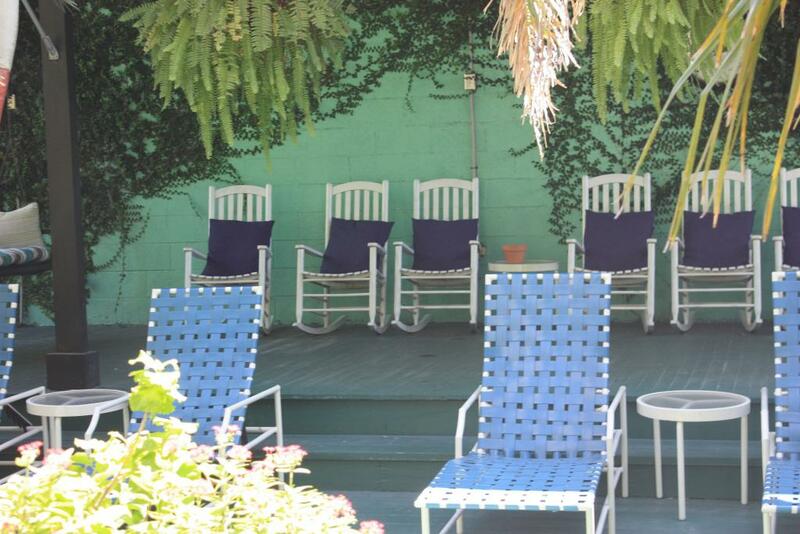 Quiet and private, it is slightly larger than the other rooms and shares an expanded sun deck. 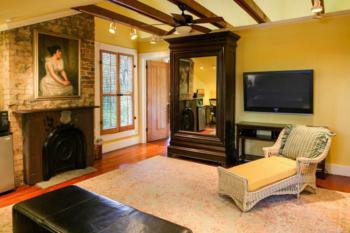 Exposed cypress beams and original heart of pine floors round out its charm. 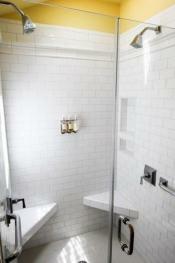 There is a shower for two and a writing desk. The Lotus Room: A balcony room on the second floor of the Inn (no elevator onsite), Lotus has exposed cypress beams, original heart of pine floors, and a writing desk. 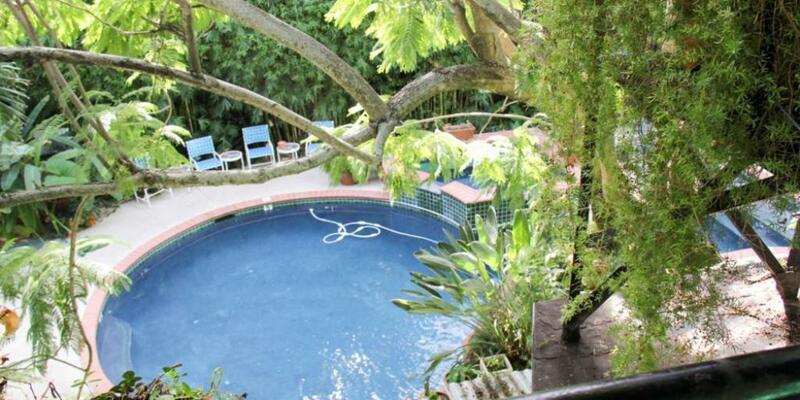 It shares a balcony with two other rooms and has a staircase directly to the pool. 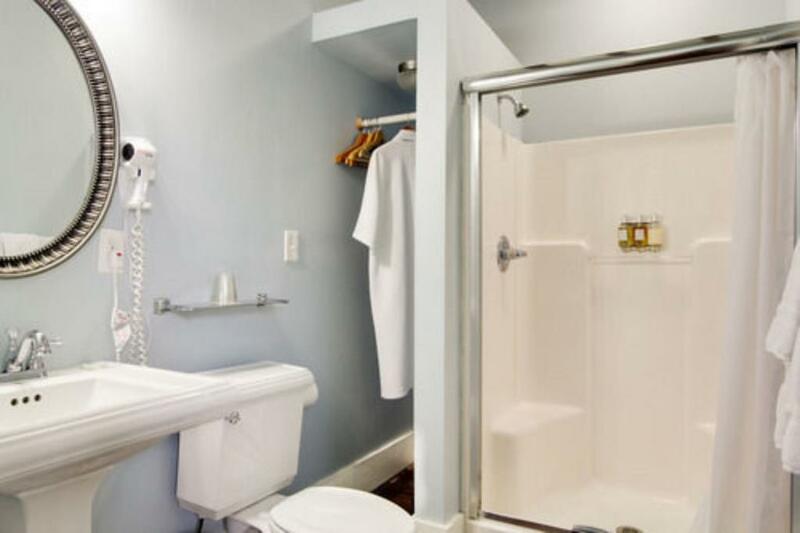 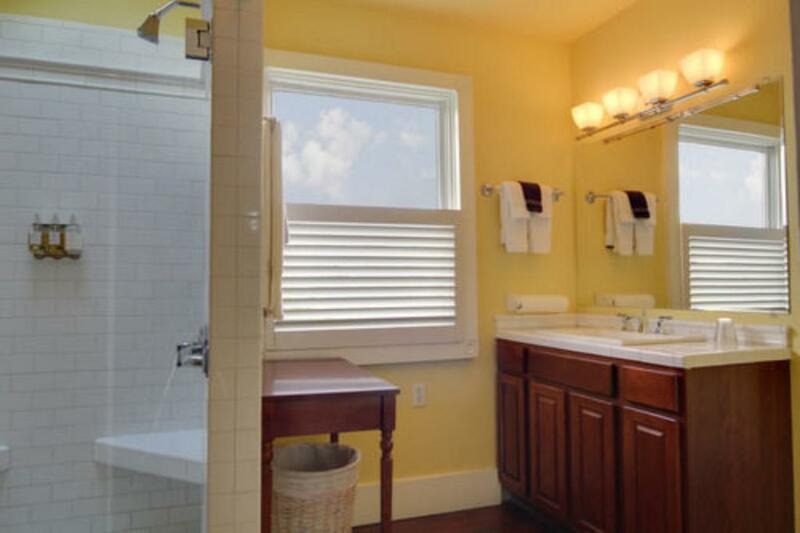 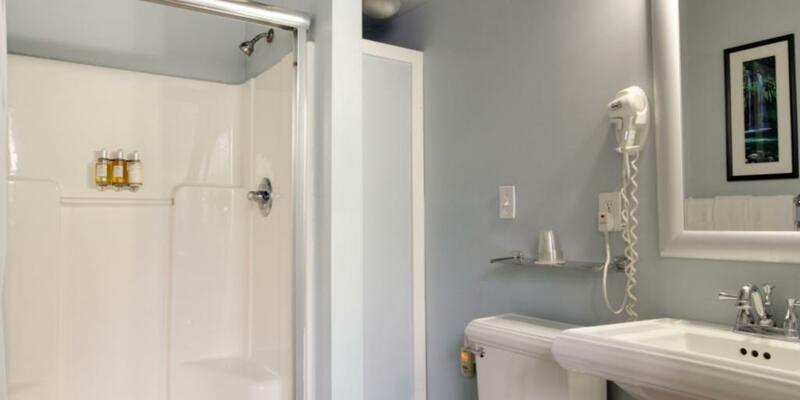 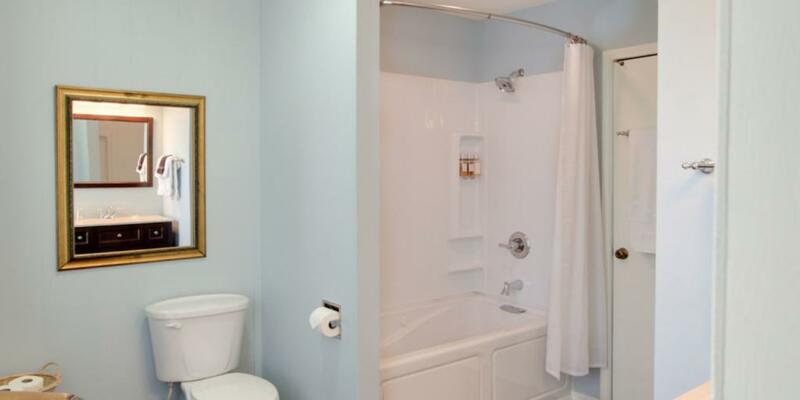 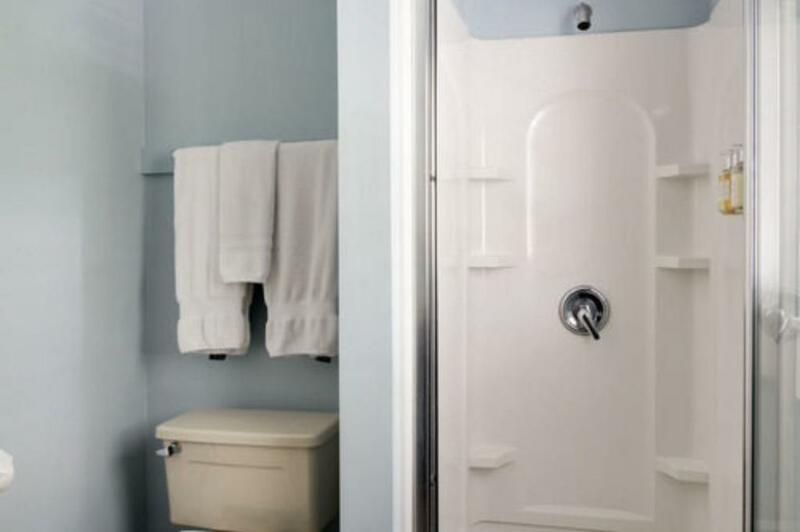 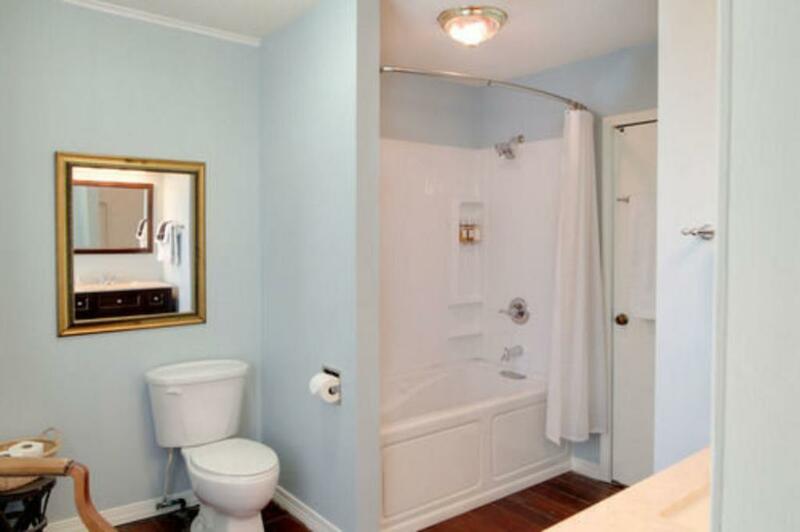 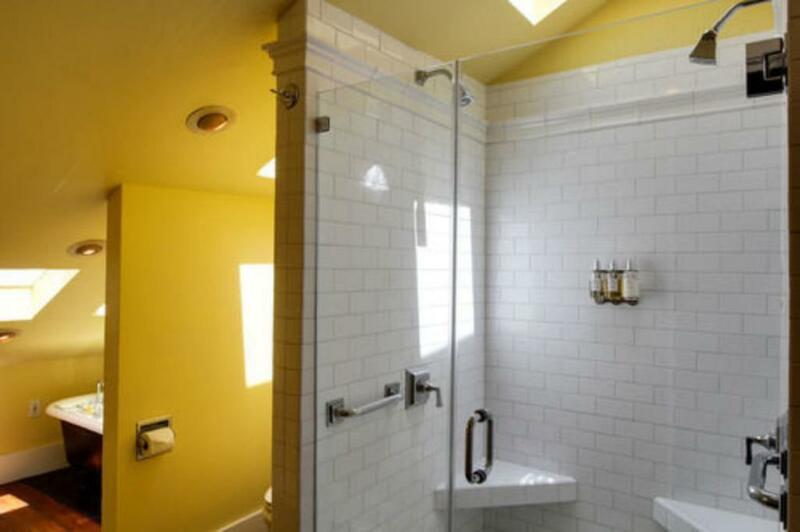 The private bathroom has a two-person shower. The Mandevilla Room: Please note there is a step down into this room and we do not have an elevator onsite. 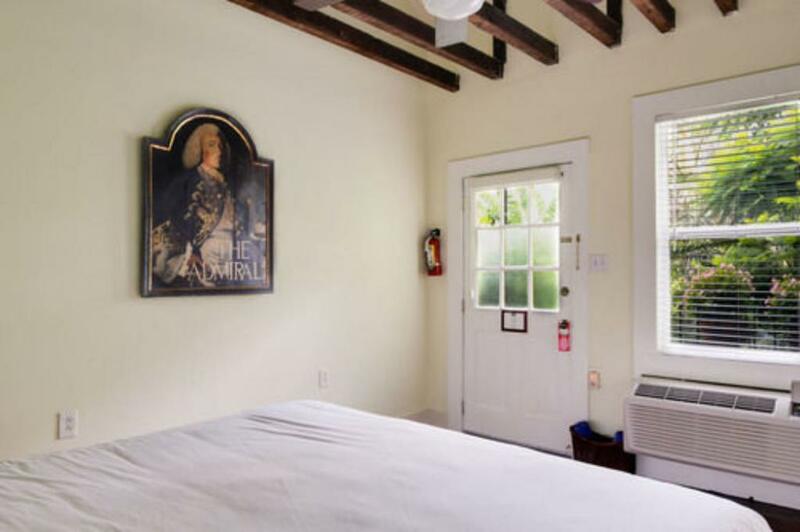 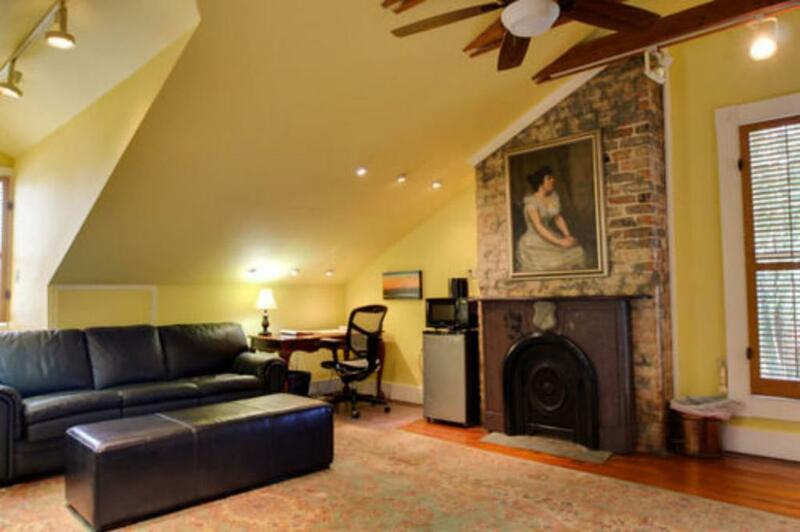 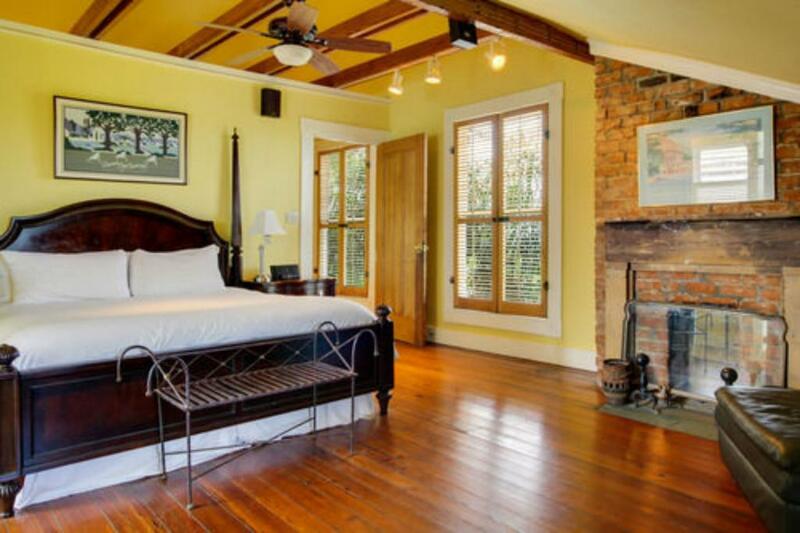 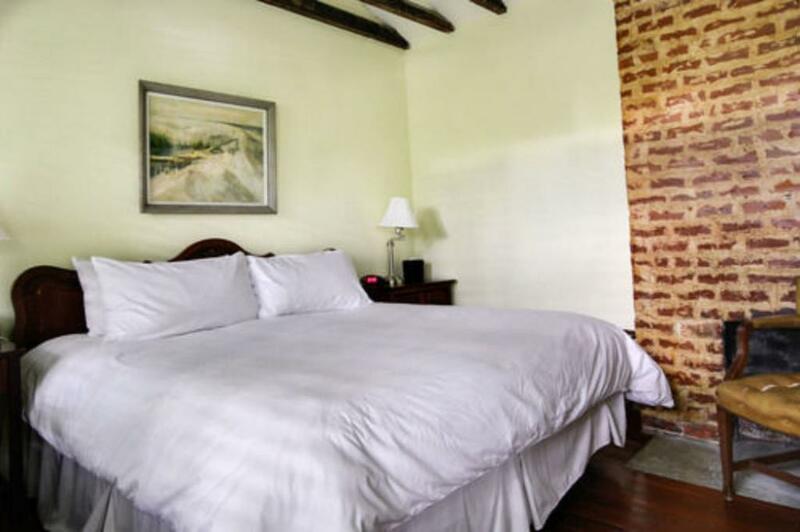 This is a cozy, second floor balcony room with exposed cypress beams, decorative brick chimney, original heart of pine floors, and a shared balcony. There is also a writing desk for all of your scribbling needs. The staircase has direct access to the pool area. The private bathroom has a stand-up shower for two. The Plumeria room is a garden view room located on the second floor, this room is located next to our library. 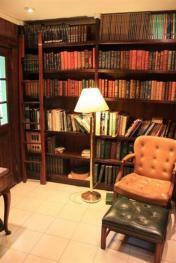 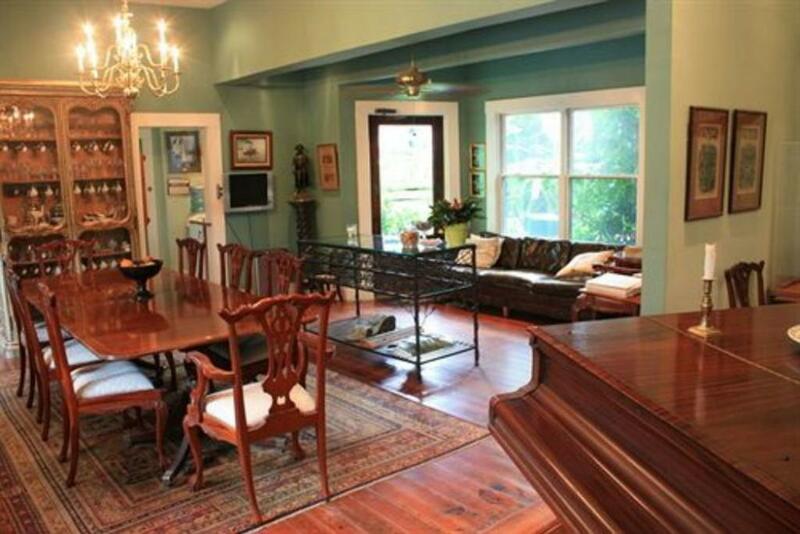 It has original heart of pine floors and a writing desk. 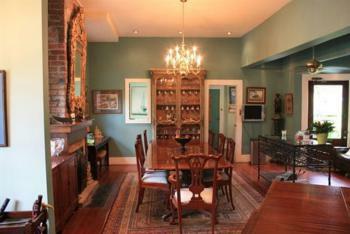 Occupying the entire third floor, this is the most private and quiet area of the Inn; it is also the largest, furnished with antiques, a writing desk, original art, and has original heart of pine floors A sitting room with king-size leather sleeper sofa and 50” flat screen TV provides a relaxing social area of the suite. 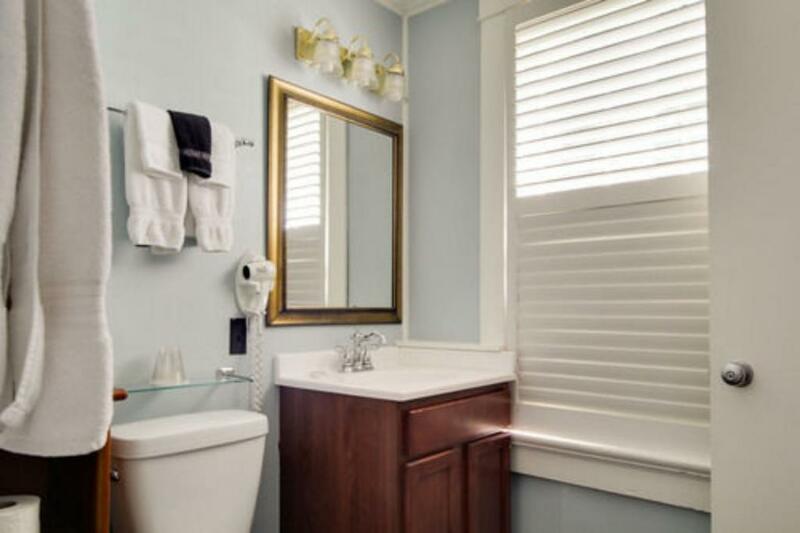 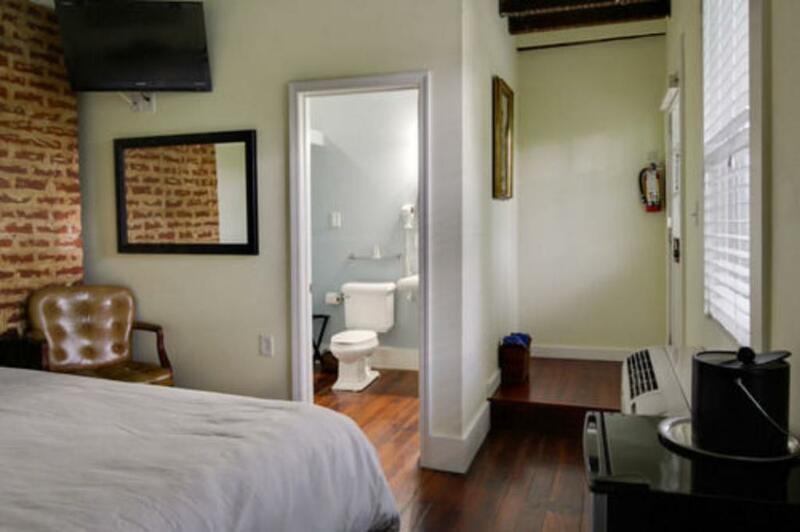 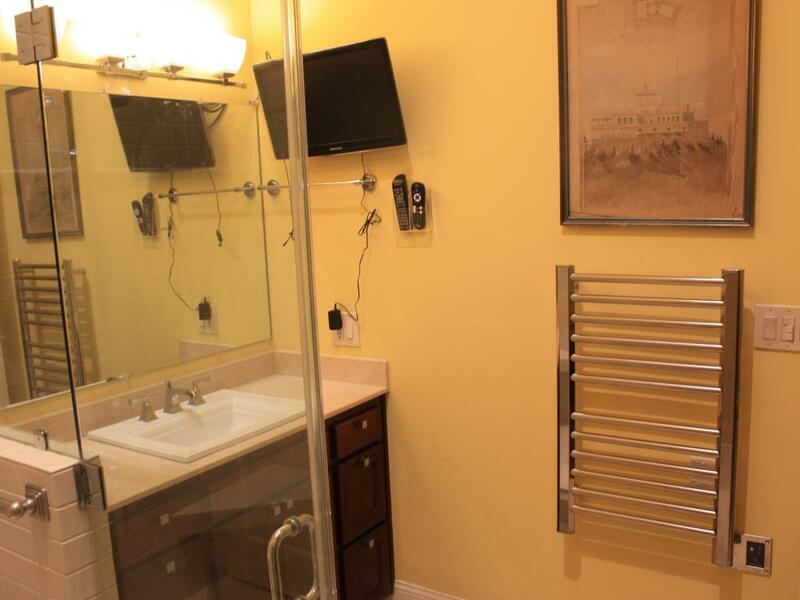 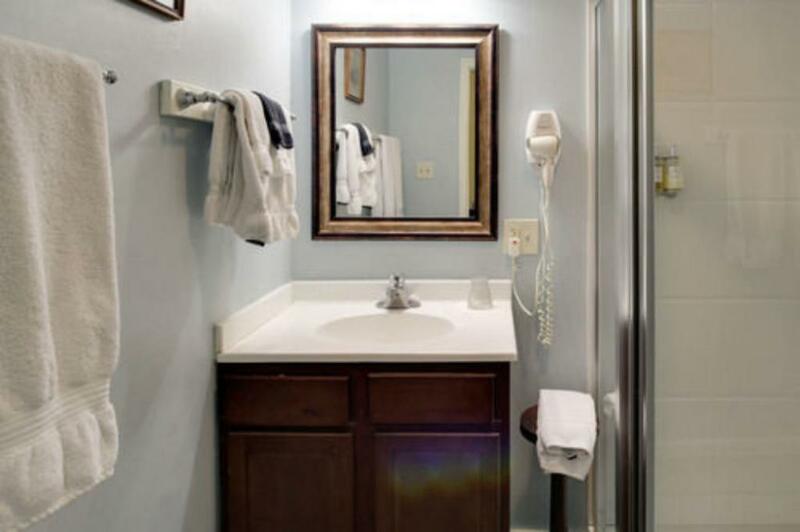 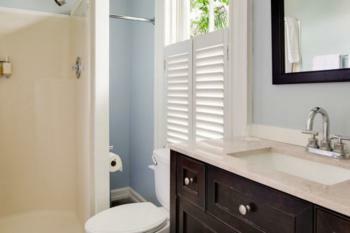 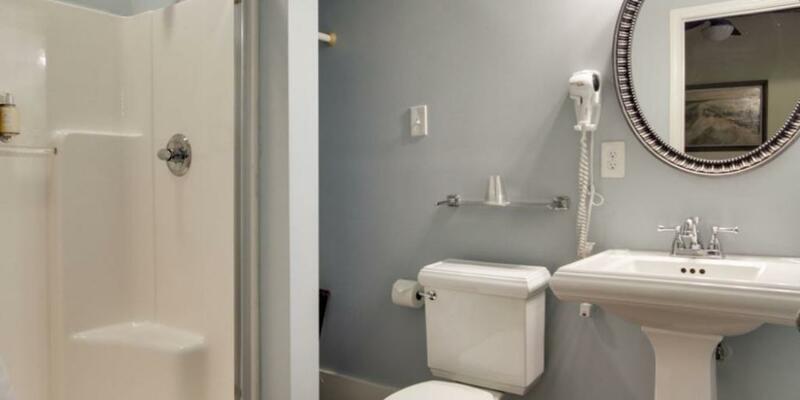 From there, you enter a bedroom (also with a 40” flat screen television) and large bathroom with Italian tile shower for two and a narrow, claw foot tub. 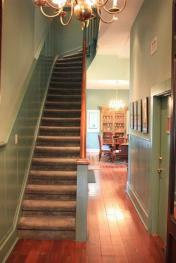 Each on the second floor of our Inn, please note no elevator on site. 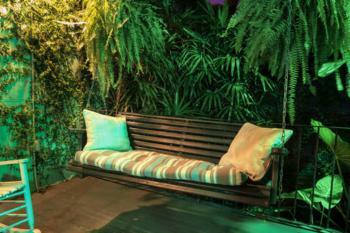 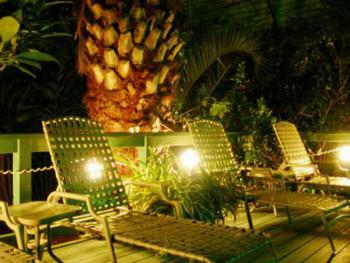 The Orchid Room: Orchid is a garden view room located on the second floor, facing Magazine Street. 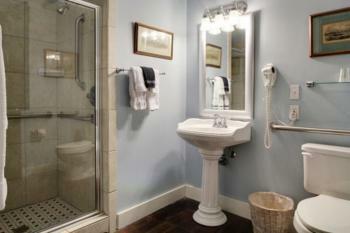 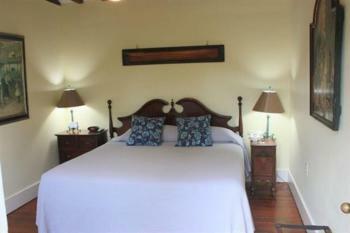 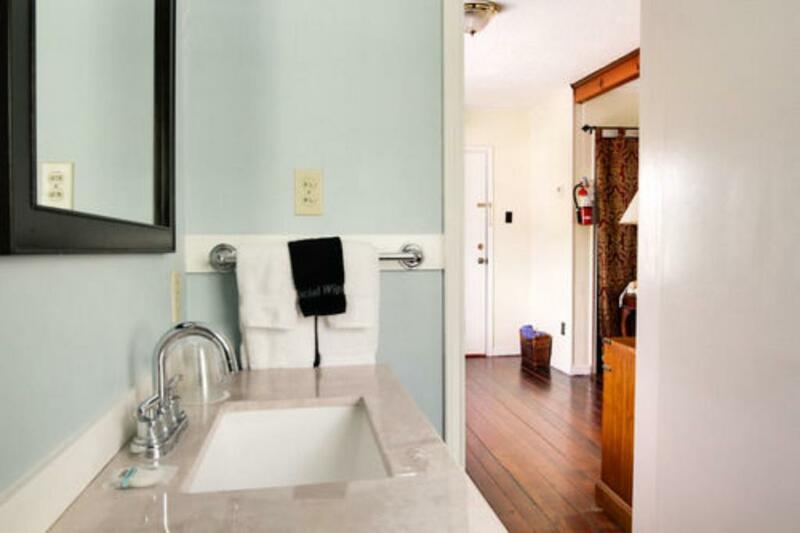 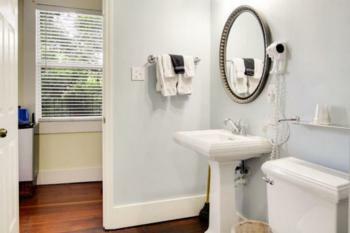 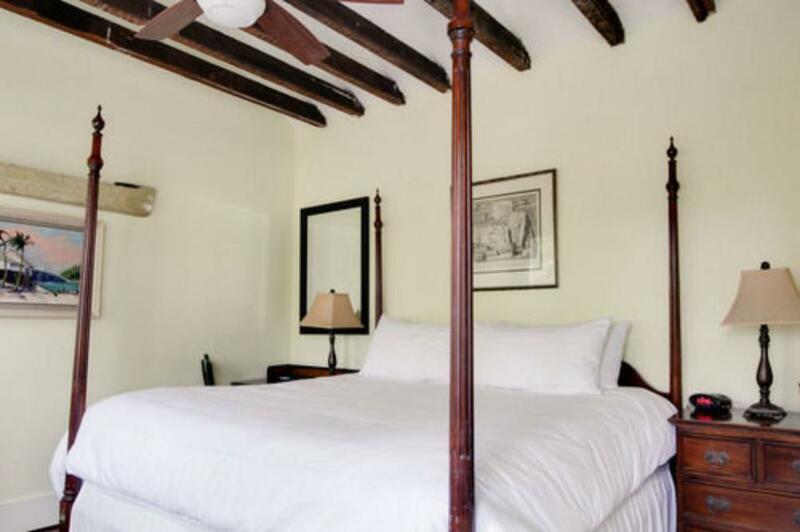 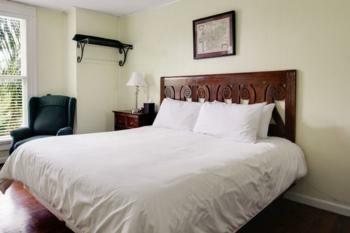 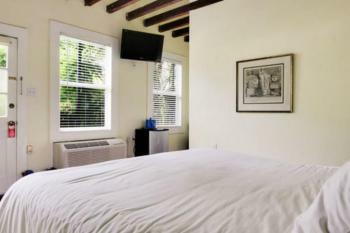 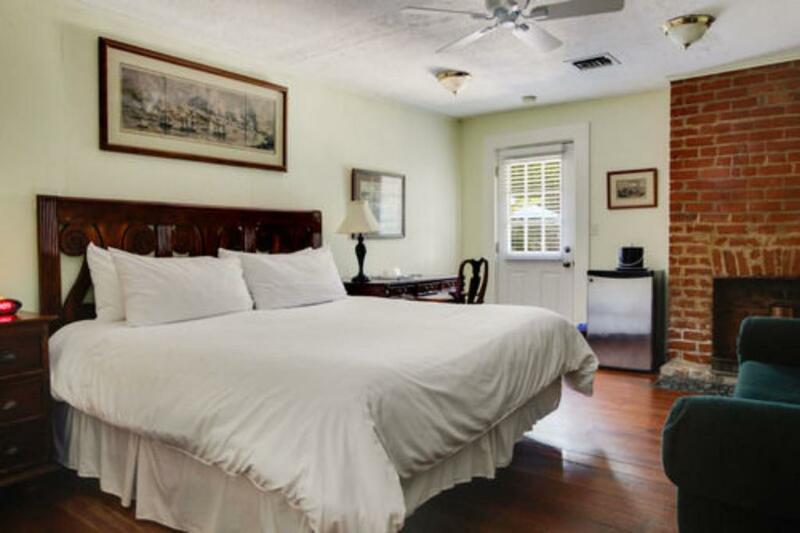 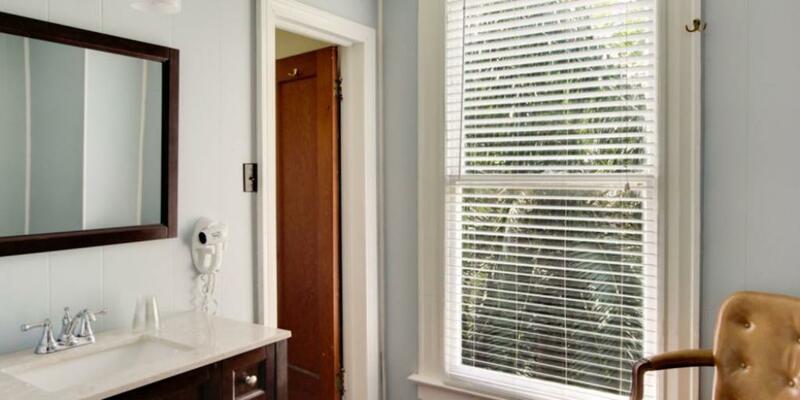 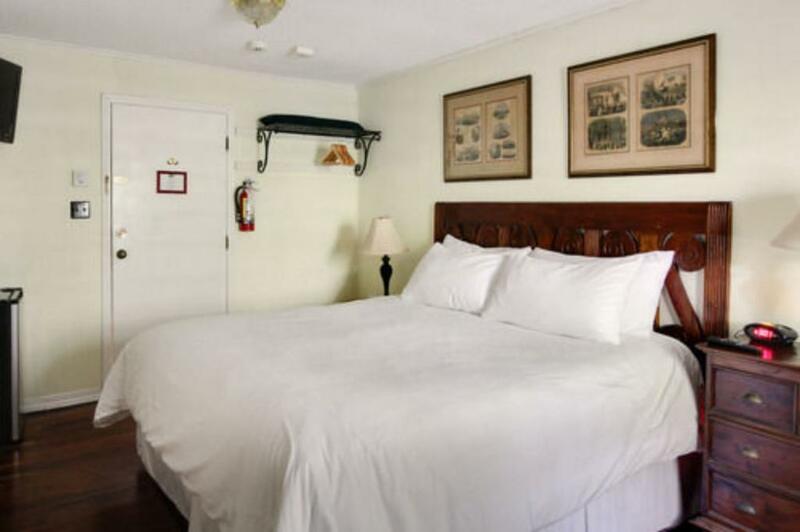 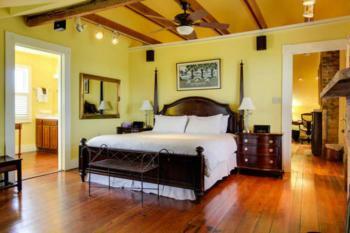 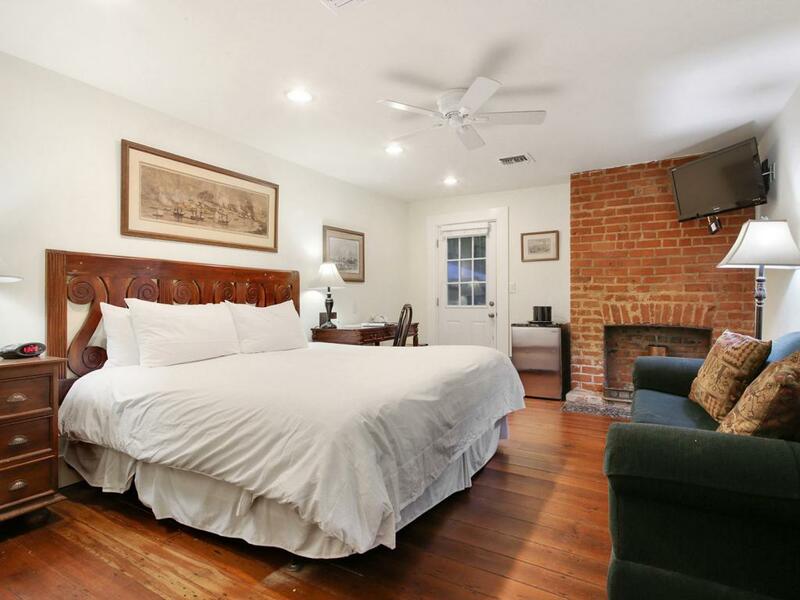 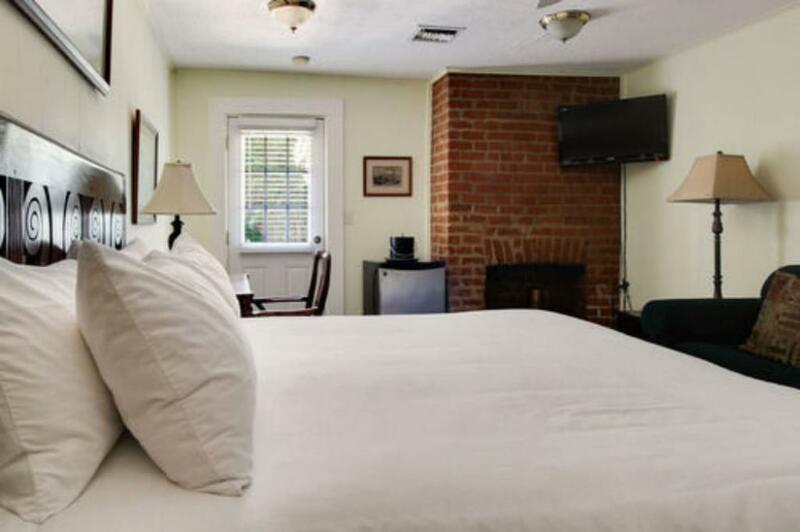 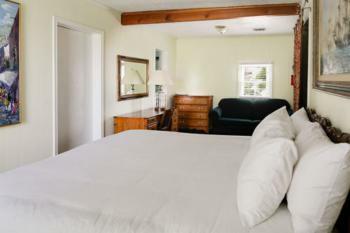 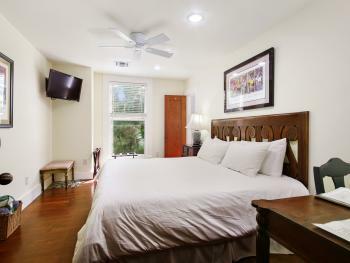 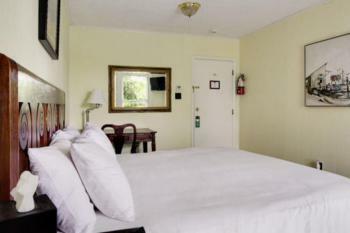 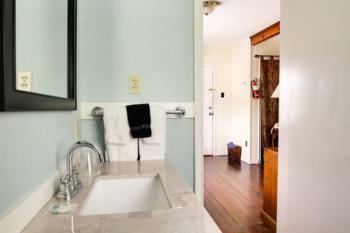 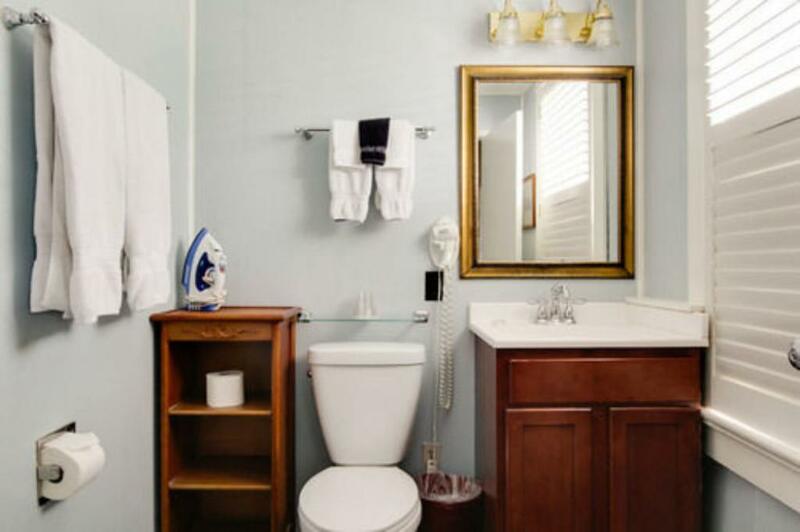 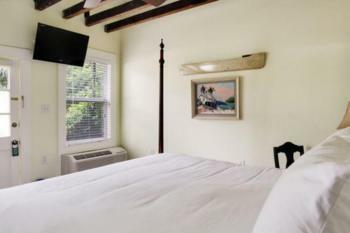 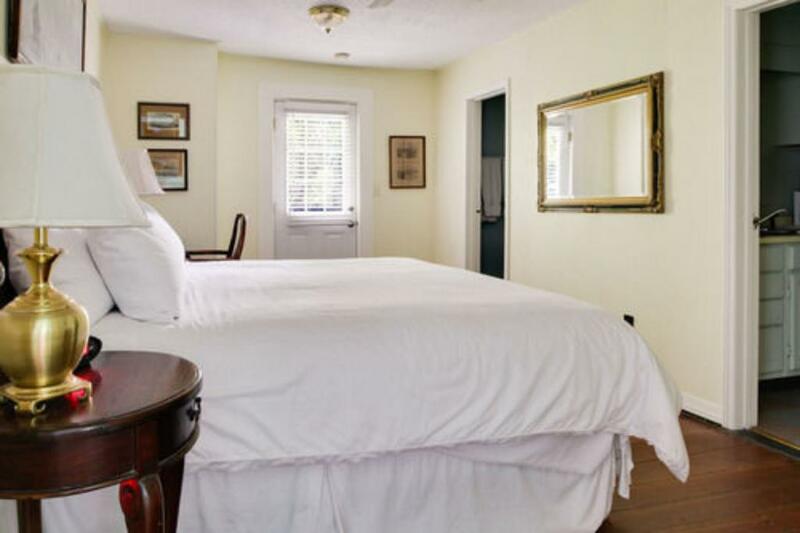 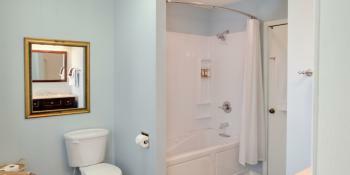 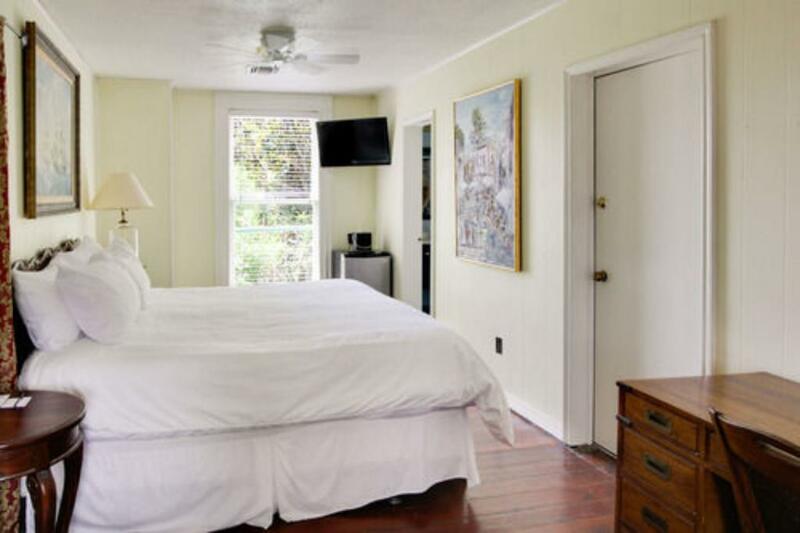 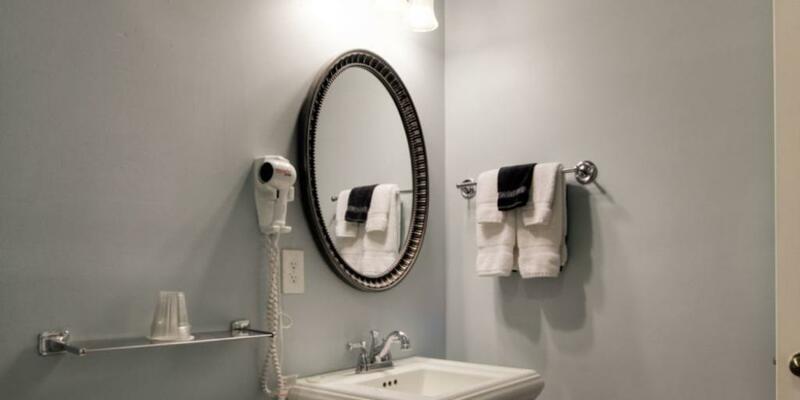 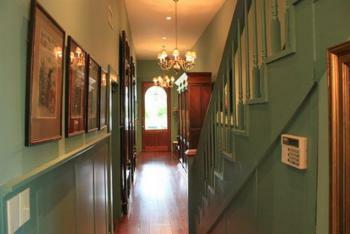 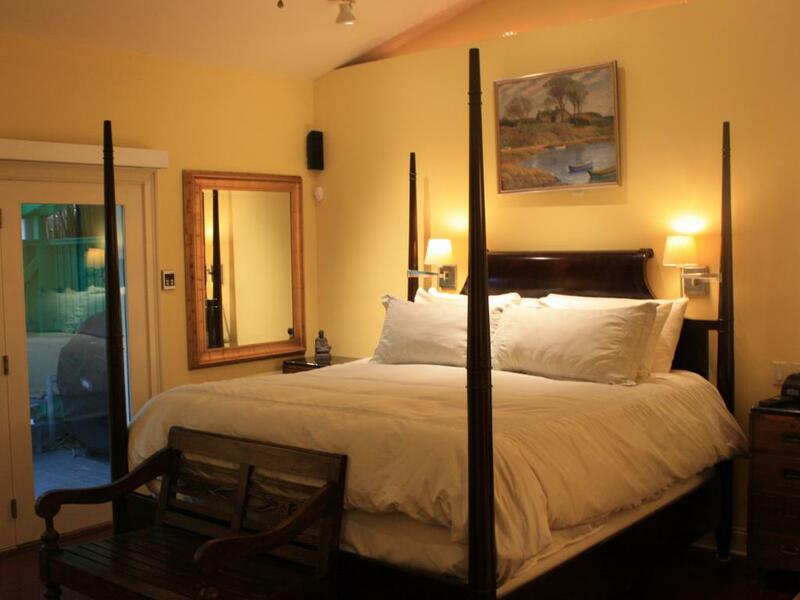 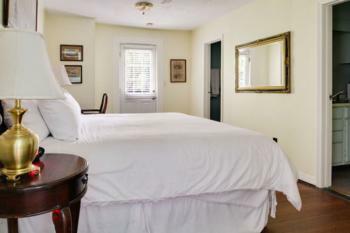 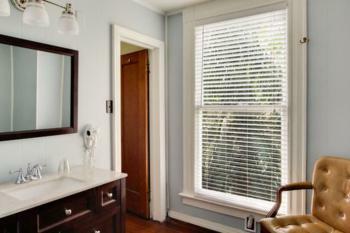 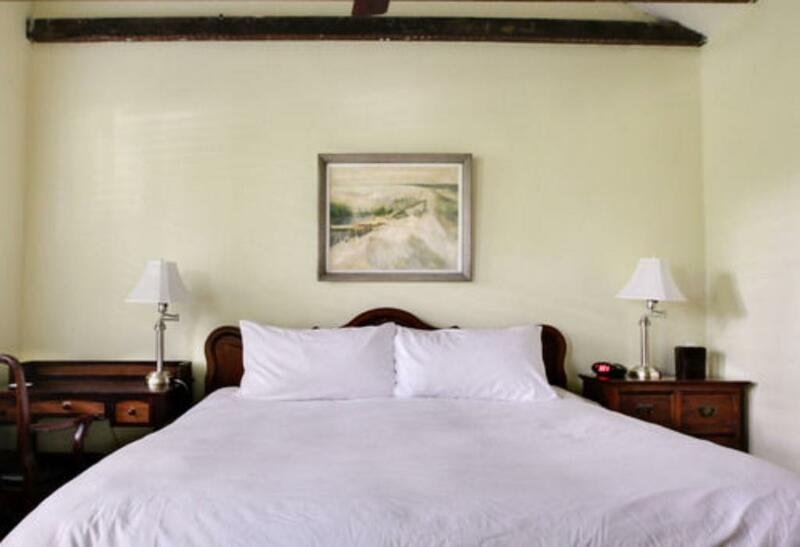 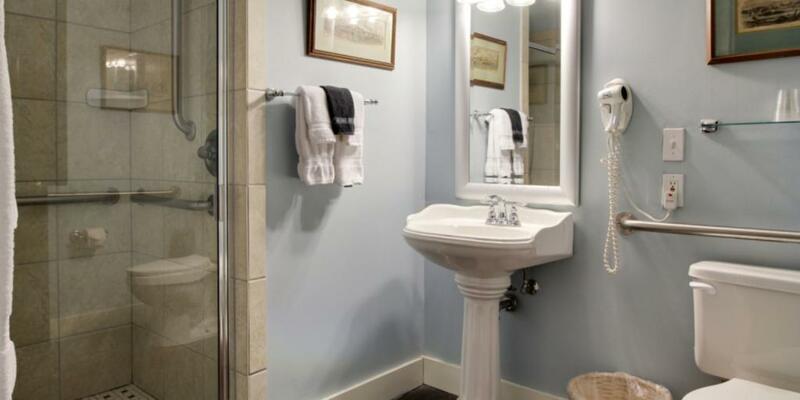 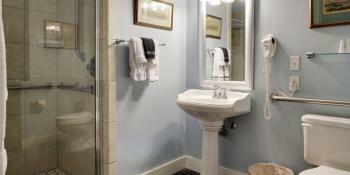 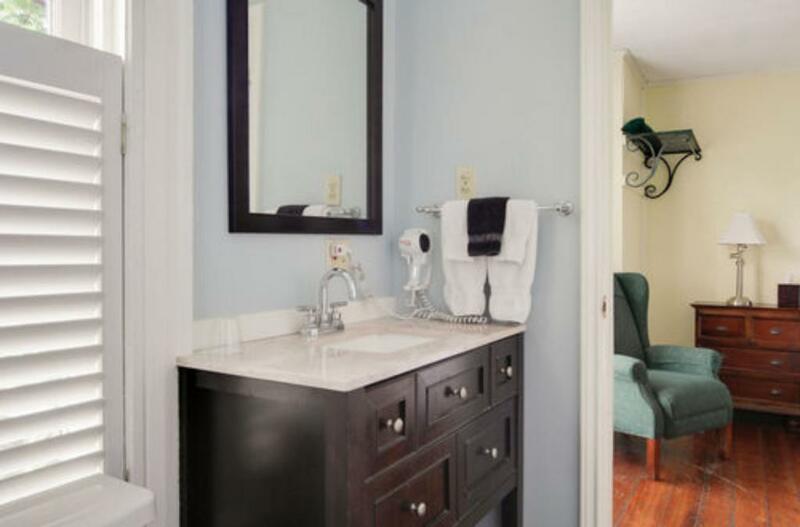 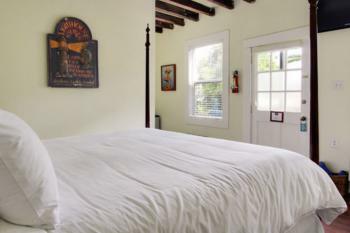 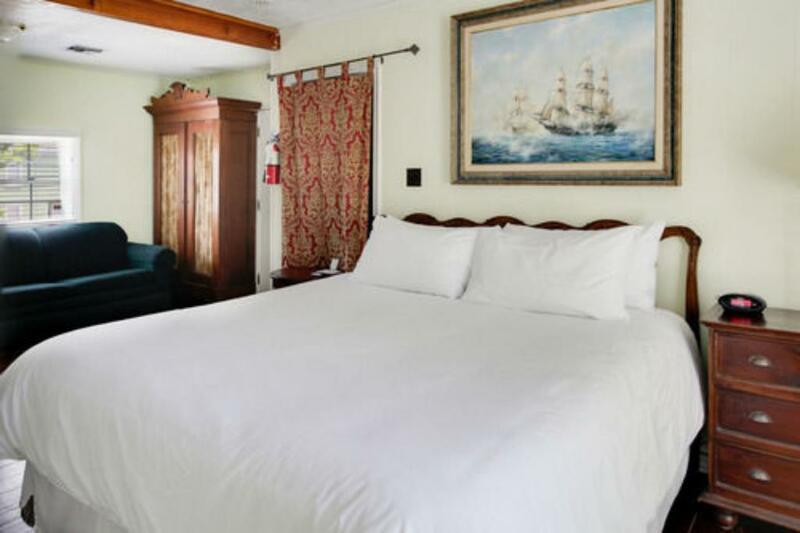 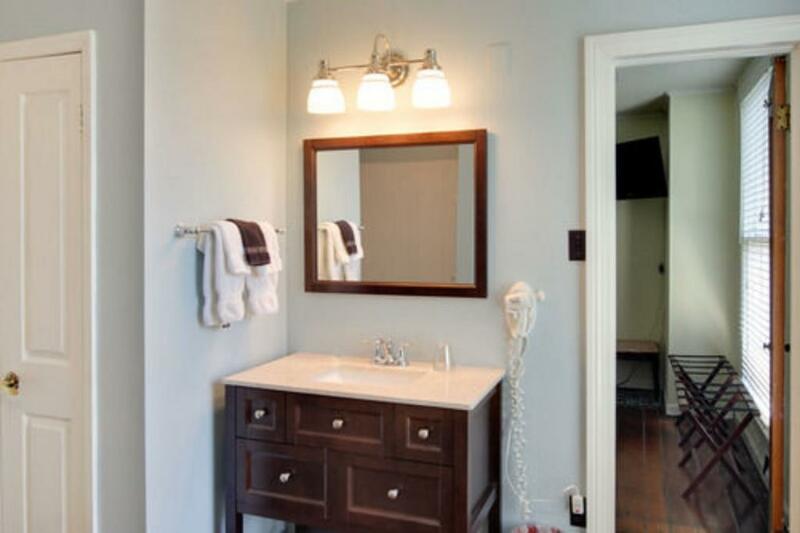 It is the largest guest room at the Inn, featuring two private baths and showers, and original heart of pine floors. 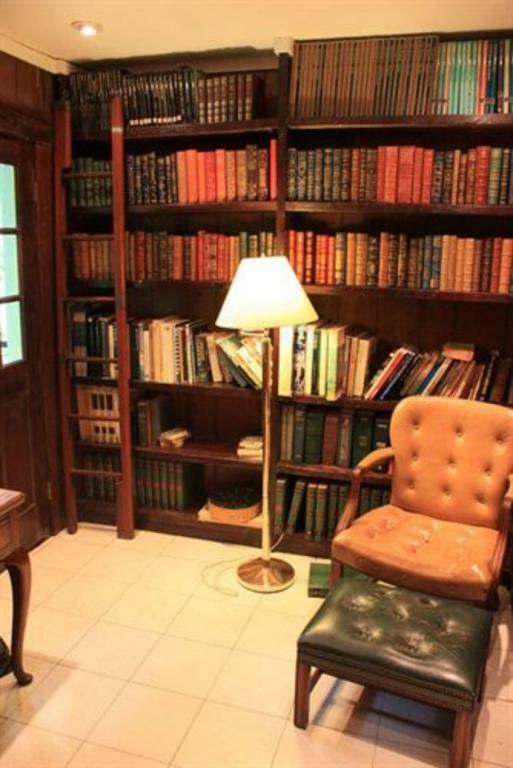 It also has a love seat-sized sleeper sofa and a writing desk. 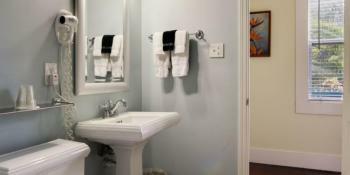 The Hibiscus Room: A favorite among tub soakers, this is our only room with a jetted bath. Like the others, it has original heart of pine floors. 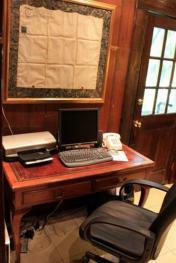 Here you may scribble on a writing desk, too. 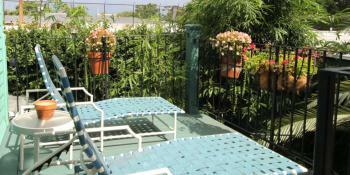 It is located on the second floor with a garden view. 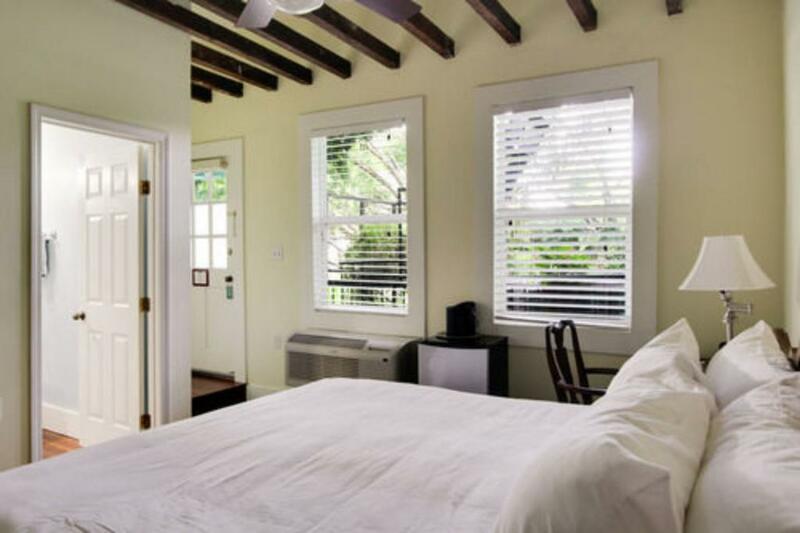 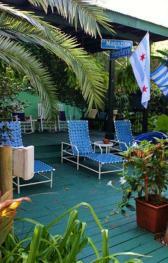 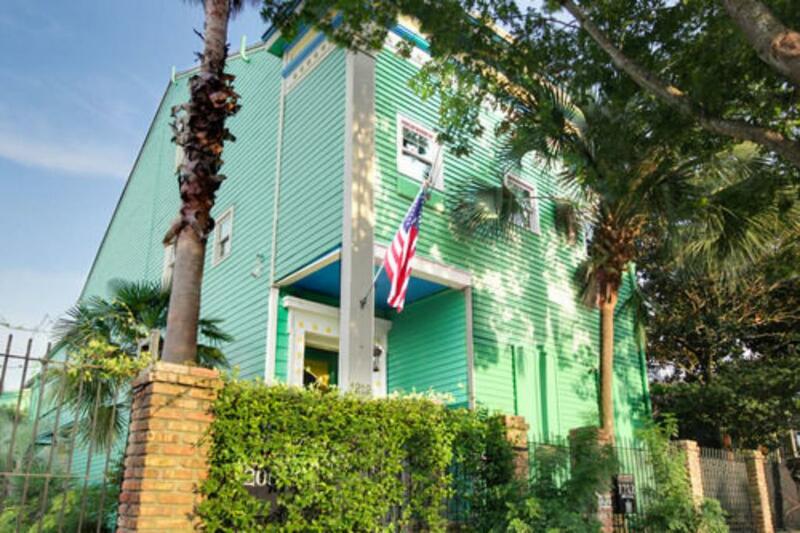 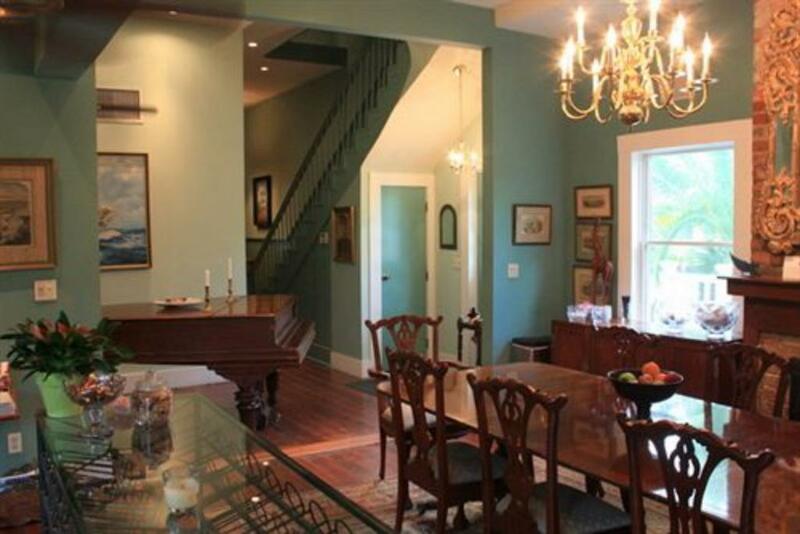 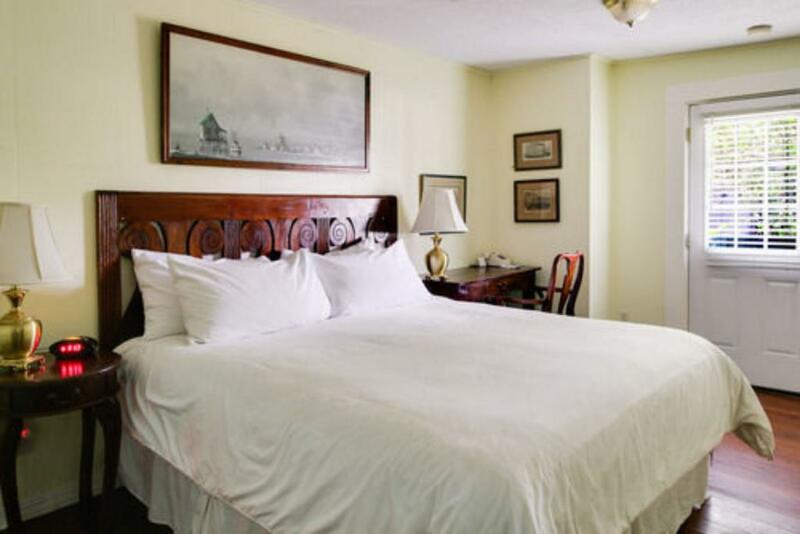 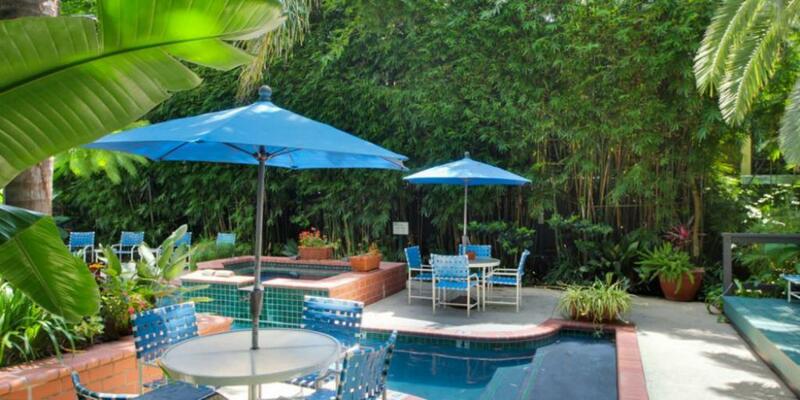 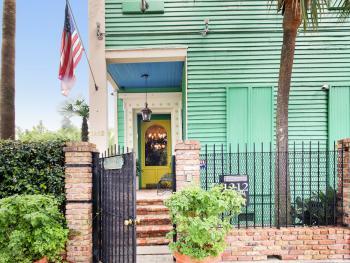 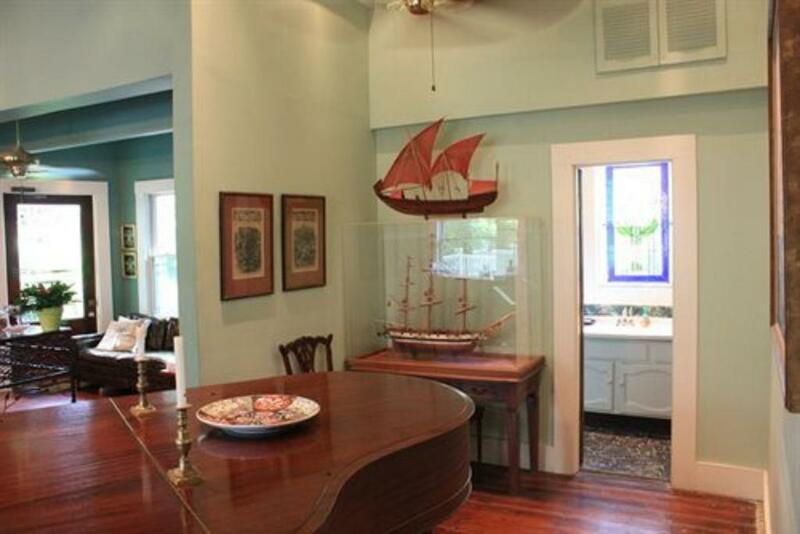 The Green House Inn is a diverse Bed & Breakfast situated in the Lower Garden District of New Orleans, an ideal location from which to start your New Orleans journey. We are pet friendly and are an adults only inn. 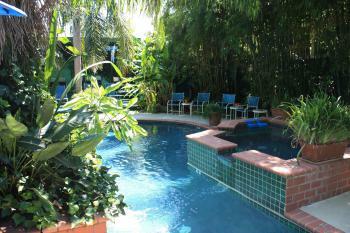 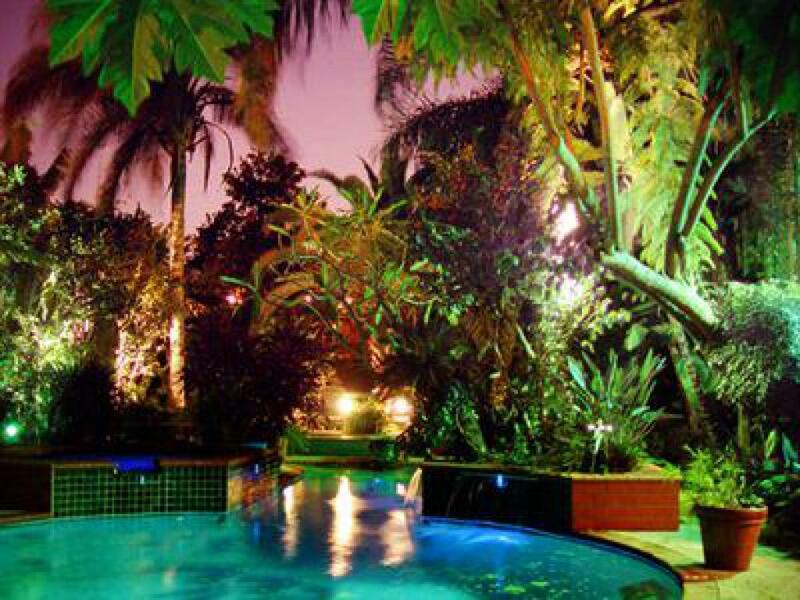 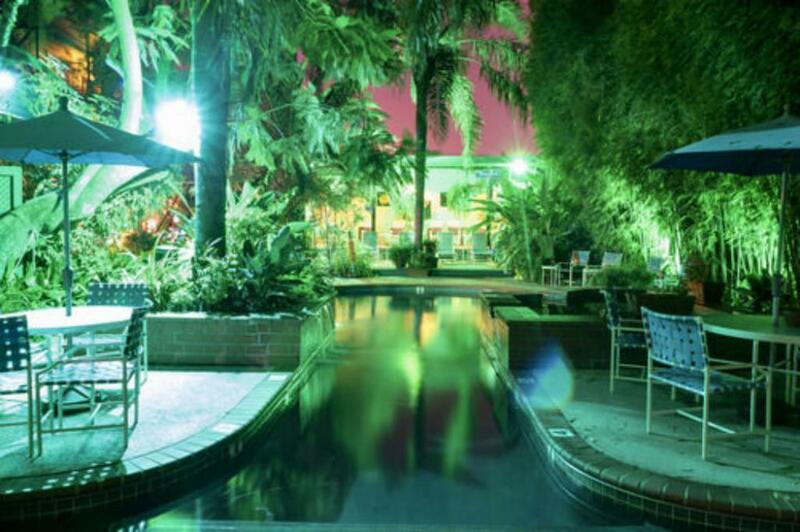 Featuring an European attitude, clothing optional swimming pool/spa set in a tropical paradise. 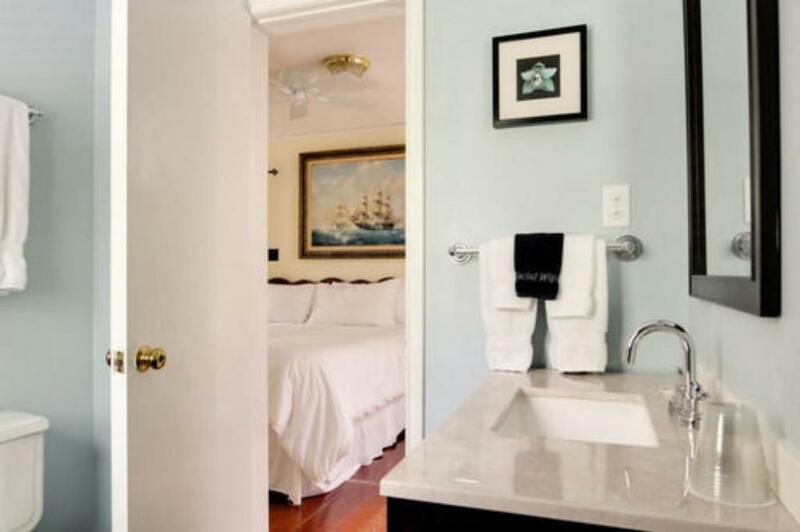 All rooms are non-smoking and feature deluxe king size beds and linens, private bathrooms with showers and toiletries, individual climate controls, TVs and clock radios. 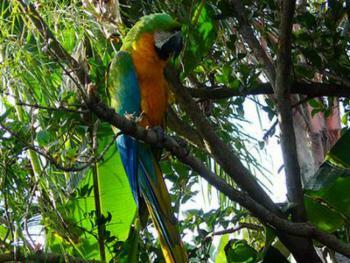 The gardens are a lush, semi-tropical paradise. Here we have a relaxed, European attitude (i.e. 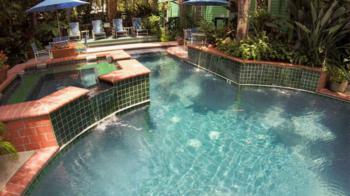 clothing optional) at the pool. Enjoy the therapeutic pleasures of our tree-shaped, saltwater swimming pool with waterfalls, fiber optic lighting, and an oversized Jacuzzi-style hot tub. 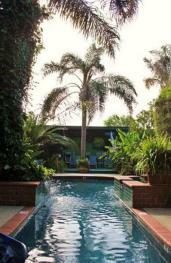 Chaise lounges, tables and chairs in both intimate and social arrangements make our pool and gardens a soothing area, whether relaxing, reading, sipping, or socializing. 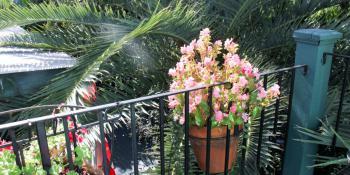 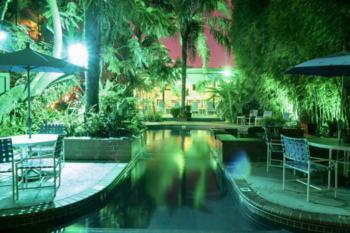 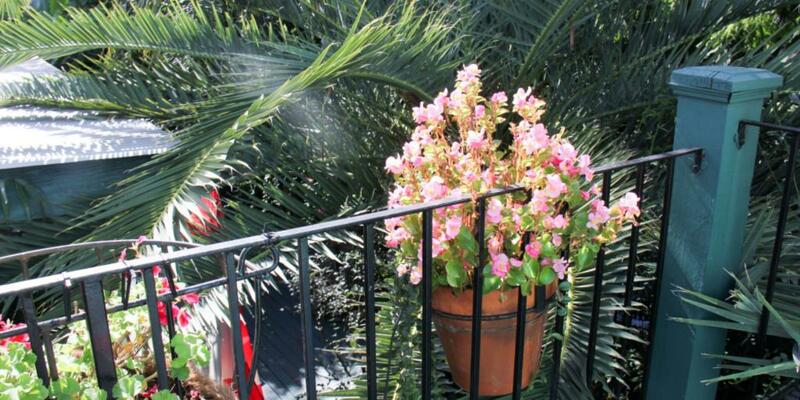 Most rooms have direct garden or balcony access to the Garden & Pool area [See our room layout for each room’s access]. 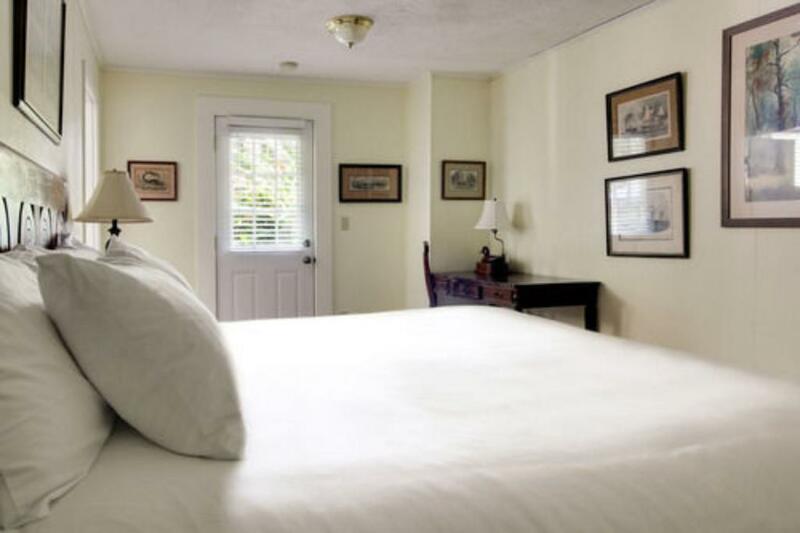 All rooms, as well as the common rooms of The Green House Inn and its environs, have free WiFi and broadband connected PC with printer for guest use. 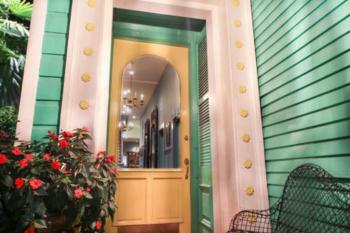 We have a library with a wealth of reference books about the history and culture of New Orleans. 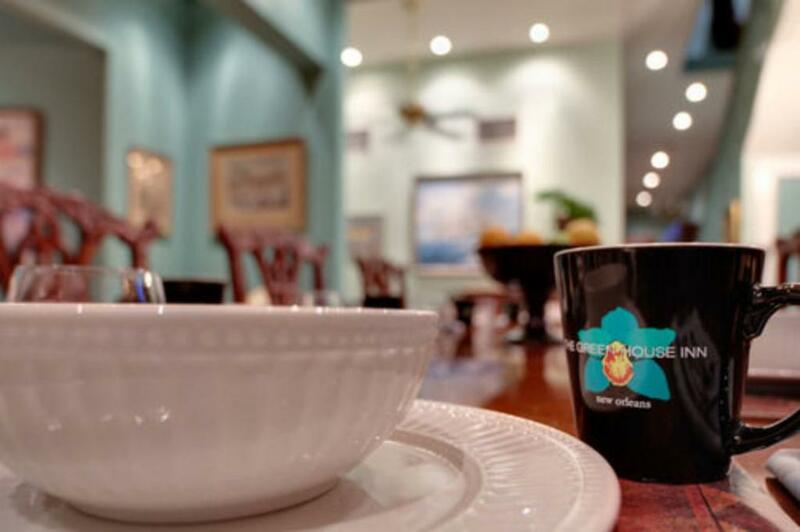 A self-serve Continental breakfast is offered from 7am-11am: coffee & tea, orange juice, croissants, muffins & toast, fresh fruit, yogurt, boiled eggs and breakfast bars; Nutella, jams, jellies. 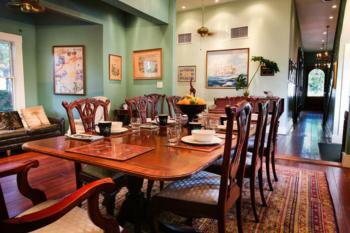 There are also two restaurants nearby that offer a full breakfast and brunch menu. 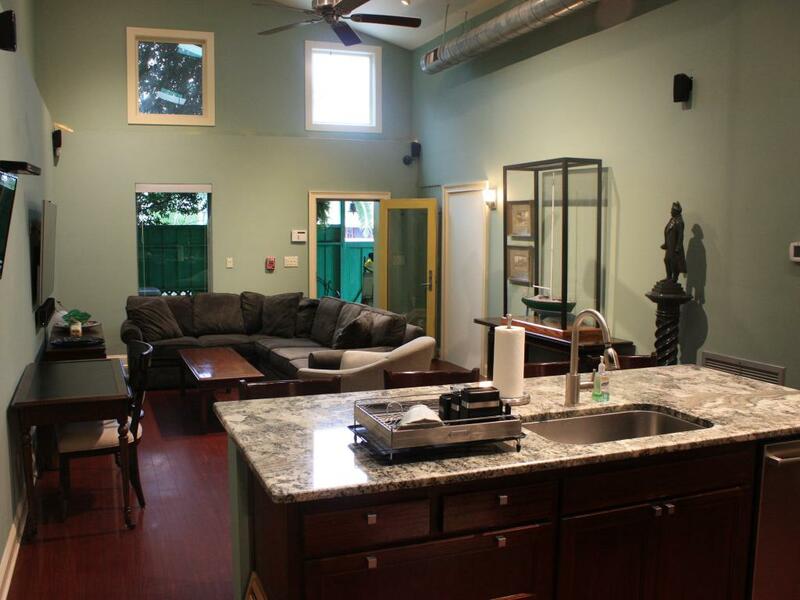 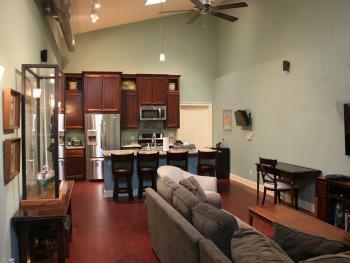 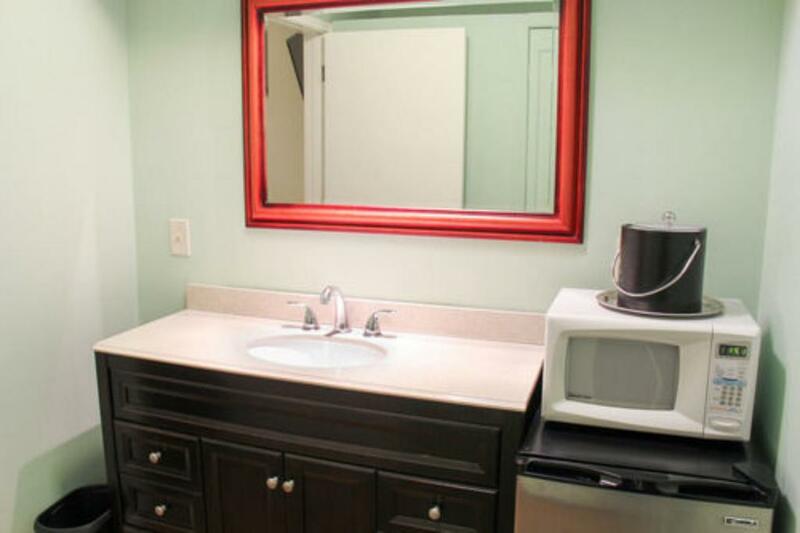 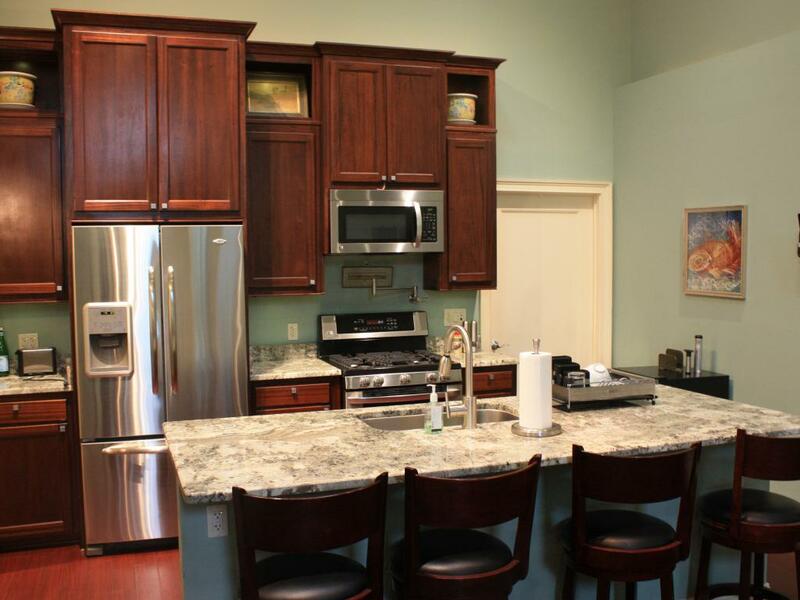 The Inn has a spring water cooler, 24/7 ice maker, nuts, fresh fruit, candy and microwave popcorn available. 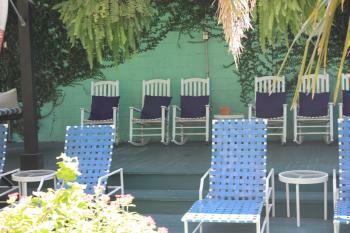 There is also a soft drink machine in the Garden area. 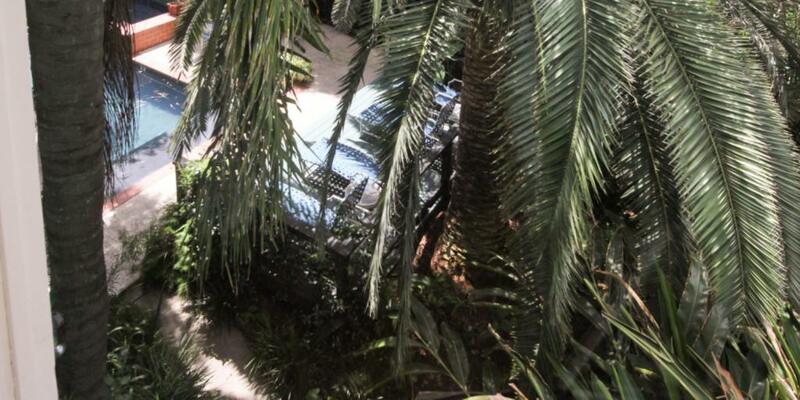 We offer one free, gated off-street parking space per guest; we have ample on-street parking for visitors. 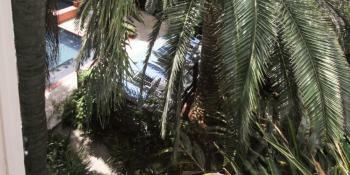 Public transit is also close by. Continue on Calliope St. Drive to Magazine St (0.3 mi), turn right.